Face it food is a huge part of our lives, but over the years food has changed, A LOT! As some of you may know we tried going Gluten Free for a time and seen a lot of great changes. We slowly fell off the great wagon we were on and will be slowly getting back on there. We are not just going GF but changing our eating habits all the way around. In reading Weeding out the Wheat it made me realize that wheat is not the only thing that has changed. It cause me to dig deeper and I find that some of the things that are in our food are actually banned in other countries. Talk about a WOW moment. Take a few minutes and check out this great video. 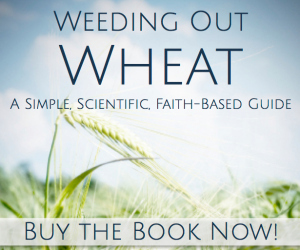 Weeding out the Wheat takes a Faith based approach to letting wheat go. So many issues that we face every day could be related to the food we eat, especially wheat, and this book can help you to slowly get into a wheat free lifestyle. The book is broken down into 3 sections. The first section gives you heath issues that wheat can cause and the changes that wheat has undergone The second helps you understand going wheat free and if it may be right for you and the third helps you move forward with going wheat free. There is even a Facebook group that you can join to get encouragement in your journey Facebook Group. For a limited time Weeding out the Wheat is on sale on Amazon for Kindles for $1.99 Click here to grab it. You can also grab the soft back book for $9.99. As we head into 2014 let's make a new resolution to learn all we can about the food we are putting into our bodies.